Evangelista Torricelli was an Italian physicist and mathematician, best known for his invention of the barometer. Torricelli was born to a poor family in 1608 and to make matters worse, his father passed away when Torricelli was just a child. The family perceived that Torricelli was a gifted child and so he was given to the care of an uncle who was a Camaldolese monk. Torricelli’s uncle arranged for him to study with Benedetto Castelli, a mathematics professor at the University of Sapienza in Rome. Castelli taught him mathematics, mechanics, hydraulics, and astronomy and in return Torricelli acted as his assistant and secretary. He held this post for six years until 1632. Torricelli was greatly inspired by the work of Galileo and he read all of his books. He was an avid student of astronomy, however he deliberately shifted his focus solely towards mathematics. This was because he wanted to avoid having the same fate as Galileo, who was taken to trial in Rome in 1633 for proposing supposedly controversial theories. Torricelli decided that mathematics was a safer choice than astronomy and so he pursued that instead. During the time that Torricelli worked for Castelli, Galileo had written a letter to Castelli. This letter was answered by Torricelli instead since Castelli was away from Rome at that time. In his reply, Torricelli expressed admiration for Galileo’s work and put forward some of his own theories. Galileo was impressed and invited Torricelli to come and work as his assistant. Torricelli did not immediately accept this; only much later did he go to live with Galileo, which was not for very long since Galileo died three months later. After Galileo’s death, Torricelli was invited by Grand Duke Ferdinando II of Tuscany to work as the court mathematician. Torricelli accepted, and held this post until his death in 1647. Evangelista Torricelli made several important contributions in the fields of mathematics and physics. One of the biggest and most controversial debates in those days was about the existence of vacuums, a possibility that had been refuted by earlier scientists such as Aristotle. First Galileo and subsequently Torricelli were of the view that vacuums did in fact exist. 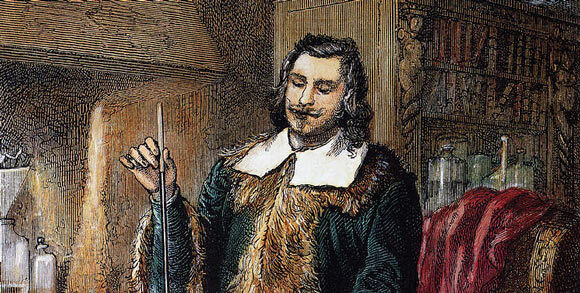 Torricelli set up an experiment involving glass tubes filled with mercury (as it was denser than water) and thus became the first person to create a sustained vacuum. This led to the invention of the Mercury Barometer, an instrument used to measure atmospheric pressure. The development of the barometer was a monumental achievement in physics, and it is still widely in use today. His other contributions include his work on the equations of curves, formulating Torricelli’s Law about the speed of a fluid flowing out of an opening and being the first person to give a scientific explanation for the cause of wind – which he said was caused by differences in air temperature and density between two areas. His other areas of interest included geometry, infinite number series, fluid and projectile motion, calculus and mechanics. The “torr”, a unit of pressure, is named after him. Torricelli published a number of manuscripts on geometry, physics and astronomy, most of which are preserved in Florence, Italy. Not only was he a great theoretical scientist, he was also extremely skilled at making lenses and mechanical instruments such as microscopes and telescopes. Some of these lenses, engraved with his name, are still preserved in Florence.